When my son was five months old, my friend Stephanie and I decided to start a magazine about motherhood. I was living then in a town that was known, in equal parts, for its college and for its poultry processing plants (and a little bit for its bustling methamphetamine trafficking business). Sometimes in the afternoons, the air would fill with the smell of chicken feed and our dogs would go insane. I had no local friends with babies. I wanted a tribe. In furious snatches, I worked in the guest bedroom while Caleb napped or while my husband took care of him or after he’d fallen asleep. Later, I hired a mother’s helper, a sweet-faced thirteen-year-old who lived on the next street over. It was only after we were all entrenched in the rhythm of our lives—the routine of domesticity, the steady ebbs and flows of quarterly magazine production, the nightly marital meet-up and reconnect—that I realized that I’d created a serious overlap between my professional and personal identities. I had an inkling it might be problematic down the line, this all-mother-all-the-time, both in practice and as an intellectual preoccupation. The end seemed a lifetime away. But it’s here now. In August, Stephanie and I sold Brain, Child. This morning at one-thirty, my husband Brandon and I were awoken by the night clerk at the hotel. Caleb, now almost fourteen, had sleepwalked out of our room and pounded on the door of another guest room. He had yelled for his dad until the stranger opened the door and explained he had the wrong room. Caleb woke then. Afterward, while sorting through the confusion—and thinking of all the ways this could have turned tragic—I hugged him, murmuring, “That must have been scary, huh, baby?” He allowed that it was and let me hold him a little longer. Raising a kid in a world chock full of potential tragedies—the exposed electric sockets! the careless drivers! the very existence of war!—is something that every parent reckons with. (Stephanie and I published quite a few essays about it ourselves.) Failing to protect the human being you’re charged with is a standard-issue nightmare. But now, looking at Caleb, stunned and sleepy in his Mario Bros. “Choose Wisely” T-shirt, something felt different to me this time. I love him, I love him, I love him. But I didn’t feel one iota of responsibility for the tragedy that wasn’t. No more responsibility than I’d feel if it had been Brandon prowling the halls, unconscious. It’s not that I think he’s not vulnerable any more. It’s just that he’s already as strong and smart and stocked with common sense as a goodly number of adults. He’s just as vulnerable as the rest of us. About five years ago, I wrote a book that wasn’t about motherhood. A local photographer got in touch with me to take my picture for the interview. “I was thinking we could set you up at a playground or a preschool, with a bunch of kids surrounding you,” she emailed me. “Um, okay,” I wrote back. “But why?” I’m not a person that little kids flock to naturally; I think they can sense that I’d rather be reading. It was then I recognized that if you know my name—not that you should—it’s tied to maternity. I’m not at all denigrating the work all of us did at Brain, Child. We helped forge the way for mothers to be seen as minds to be reckoned with, intellectually and artistically. In the magazine, we uncoupled motherhood from consumerism, bleached it clean of sentimentality, aired out the stereotypes that keep Us and Them categories possible. As the great essayist Catherine Newman complimented us, “They have always understood, it seems to me, that it’s a political act, editing. To really listen, to represent, to illuminate, you have to let voices be different from your own, and they have.” What we did was a subset of feminism, the one that declares that what women have traditionally done—the care giving of the next generation—is important work and deserves respect. Motherhood is not the only important work women do, of course. So this is where I find myself, both personally and professionally: looking for other important work. A few weeks ago, an out-of-town friend posted on Facebook that she was having lunch with me. 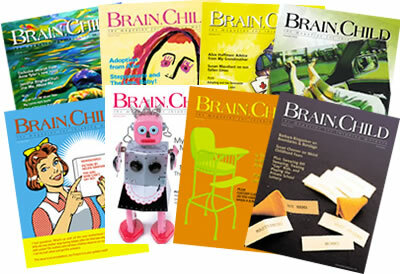 “Jennifer of Brain, Child?” someone else asked, as if Brain, Child were my tribe, ethnic and cultural, a nation. We were, that that point, in the middle of negotiations to sell the business. I stared at the computer screen, thinking of the Brain, Child tribe scattered across the world. I had myself a little Lear moment then, realizing that we were selling the keys to the kingdom, that I wouldn’t be Jennifer of Brain, Child anymore. For a while, I was working on a novel called Dear Descendent. It was going to be this brilliant po-mo thing into which I could lazily slide my own genealogical research. The meat of it would be about legacy and what each of us leaves behind when we’re gone; the narrator would be unaware of her arrogance in believing that she’s special enough to warrant posthumous attention. As the novelist, though, I’d play it both ways: using my own life to leave a fictionalized legacy, all the while knowing the arrogance implicit in thinking that in a hundred years, anyone will know my name, my work, the quirks of this particular brain. I was describing the project to my friend Jessica, a memoirist, over cocktails when she was in town—a different town by then—as a guest of the Virginia Festival of the Book. She took a sip of her drink. “Well, I’m not going to have descendents,” she said in her matter-of-fact way. I already knew this. Jessica’s memoir Invisible Sisters chronicles her childhood and young adulthood in which she lost both her sisters to two different genetically inherited diseases, eventually becoming an only child. Whether and how the world remembers Jessica Handler will have nothing to do with her fertility and care giving. Yet I know every woman—mother or no—feels her fertility acutely, if only because of the questions. Are you going to have a baby? When are you going to have a baby? When are you going to have another? Are you done having babies? However you answer, the Oracles of the Uterus are pretty sure you’re going to change your mind. I have dreams sometimes that we return to our old house. We barge right in, and when the new owners protest, we look at them like they’re crazy. We were here first! We set up wherever we want to: the sunroom with the Roman shades that I had custom-made and where I nursed Caleb; the bathroom with the clawfoot tub, one foot broken off and replaced with a small stack of bricks; the basement where I lost one of the tiny diamonds in my ring. I don’t know why I have these dreams in which I lay claim to something that I used to have and didn’t want any longer. I suppose it’s my version of Having It All, the persistent media bugaboo of women. I want the past me, the present me, the future me all at once. I want the palimpsest of me. Elizabeth Warren used to be a Harvard Law School professor before she got into politics. Jesse Ventura used to be a professional wrestler before he got into politics. Al Franken used to be a comedian before he got into politics. Barack Obama used to be a community organizer before he became a Senator and then the President. Author John Grisham was once an attorney. Talk show host Ellen Degeneres was once an actress and comic. Rapper Snoop Dogg was once a pimp and a drug dealer. Author J.K. Rowling was once a struggling at-home mother. But also: Harper Lee never published another book after To Kill a Mockingbird. Maureen Tucker played drums in the Velvet Underground before she worked at a Wal-mart distribution center. Bruce Jenner was an Olympic athlete before he became the Kardashian patriarch. I’m trying, as the T-shirt says, to choose wisely. I am at mid-career, and part of me is terrified that I only get so many missteps before my legacy ends with Caleb’s childhood. The hardest thing I ever had to write was in January 2010, when my grandfather died, and my family asked me to write his obituary. I sat sobbing at the computer with tears and snot running down my face and onto the notes I’d taken about what the family wanted included. My grandfather had accomplished a lot, from military honors in World War II, to his long marriage to my grandmother, to their sending off all four of their kids to college despite periods of Dickensian poverty. He was a strong male figure in an extended family that was running a serious deficit in the good men department. I typed and erased, typed and erased. Grandpap loomed big in my heart, and I was honored and terrified to be the one who would pen the official legacy that any genealogist would find in the future. Obituary writing is a very specific form, not one that can hold stray memories, which tend to be dearest to me. I thought of his wide smile, the way he called me “doll,” his grip around my waist on my wedding day. I recalled his handsome thick hair that Caleb has inherited and how we’d tease him about primping. I thought of how, when his memory started to falter, I bought him a pen with a recording device and how he and Grandma used it to punk their friends at the bowling alley. I remember sitting languidly on the porch swing, toes grazing the indoor/outdoor carpet, rapt by his stories. After his death, I worried about my grandmother and my mother, and I tried to be someone against whom they could lean and rage and mourn, a job that Caleb will have to do some day (long, long into the future, I hope). In the triage of grief, I didn’t process my loss until long after it occurred. I got comfort from believing that the real question isn’t if you’ll be remembered in a hundred years. The real question is whether you had people you loved and whether you had people who loved you back. Oh, dear descendent, I’m trying to remember this every day: There’s a time to bang on strangers’ doors, and there’s a time to just stop for a while and let yourself be claimed. So wonderful to hear Jennifer’s voice in VQR. In addition to being an excellent editor, she is a very fine essayist. Not enough legacy? I respectfully disagree. Aw, Kristin, you made my week! Though I love Brain, Child, I loved Practically Perfect even more. I read much of it out loud to my husband, nearly crying with laughter. I don’t think of you as banging on doors so much as laughing and talking on park benches and public spaces – for 13 years, people have been slowing down, sometimes sitting down to listen, sometimes join you, then going home and resuming the conversation with other people they love– a very, very fine legacy, indeed. And you have more? I think I can speak for your Brain, Child readership when I say, “Bring it on!” We can’t wait . . .
Sorry–that should have been (obviously) “Delanie.” You’d think a Niesslein would be more careful. Best thing I’ve ever seen published in VQR. The Best Thing. And perfect for a Thanksgiving morning. Thank you so much! I read Practically Perfect first and then became a Brain, Child subscriber. Like Delanie, I remember laughing out loud while reading Practically Perfect and it is a book that I still recommend often. I will also look forward to whatever you’re going to do next and in the meantime, I’m going to buy a gift subscription to Brain, Child for my sister in law, who is about to have her first baby.